A very long time ago, I bought a box of pearl sugar at a local gourmet store. I had made Liege waffles once before, but that time I just used granulated sugar. Only now did I get around to making them. What is a Liege waffle, you ask, and why do you need special sugar? 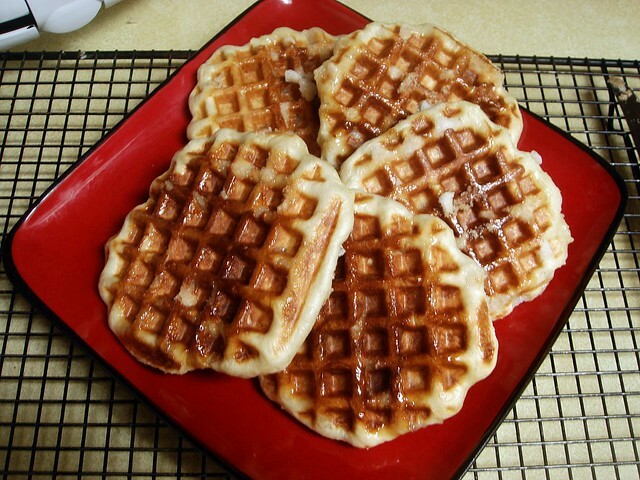 I will tell you that a Liege waffle, popular street vendor fare in Belgium and other countries, is a type of enriched yeast waffle made with butter, eggs, and milk. How these differ from standard waffles is the pearl sugar, which is mixed in after the dough has risen. This technique keeps the sugar from combining with the dough, which it would if it was added earlier. As the waffles cook, the sugar exposed to the hot iron is caramelized, while the rest of the sugar remains whole, lending sugary crunch to the waffle. So I found myself, on a rainy, dreary Sunday, putting together the dough for Liege waffles. I used the recipe from the back of the box. It was a little vague, so I used my own technique (not one I actually created), and the only modifications made were to use a stick less butter and add lemon zest. After the yeast is proofed in lukewarm milk, it is added to the flour along with beaten eggs. The mixture was really shaggy and wasn't smooth, but once I kneaded in the softened butter, the texture changed dramatically. Once all the butter was kneaded and the dough came together, I stopped and let it rise for a brief 30 minutes. I probably didn't knead it for 10 minutes, though I didn't feel it was necessary in this instance. Once the dough has risen, the pearl sugar is kneaded in. The recipe called for the entire bag, but I felt that ended up being a little excessive. I had a bit of difficulty getting the sugar thoroughly mixed because there was so much of it. Next time, I would try it with just half a bag and see if it yielded good results. When the sugar is mixed in, the dough gets portioned into 3 ounce pieces. I got exactly 13 dough balls out of this batch. There is no second rising, so now is the time to heat up the waffle iron while you do this. Now. My waffle iron is a very basic, nonstick machine. It has no brownness setting or timer, save for the green light that turns on and off when a waffle is supposedly done. Because of this, I timed the waffles manually, cooking them for 4-5 minutes before removing them to a wire rack. You don't want to overcook the waffles, lest the sugar cool to be rock hard. 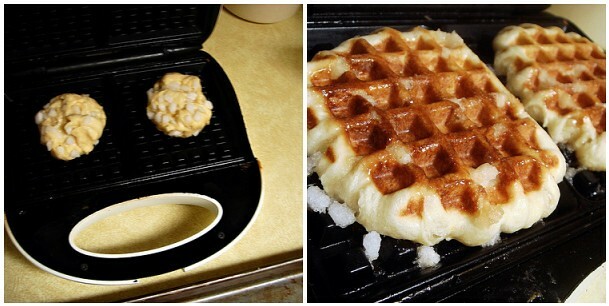 At the same time, you want the inside of the waffles to cook. To note, I didn't close the waffle iron completely to allow for the waffles to expand. I was able to barely latch the hinge without letting it flap open. And there you have it. With these waffles, you don't need syrup. However, they'd be good with hot fudge, ice cream, jam, or whipped cream. I really liked them, and they're a lovely treat. The only downside is the cleanup. I wet a double layer of paper towels and put it inside the waffle iron, closing down. This released some of the sticky, caramelized sugar. After that, I ironed bread slices, which seemed to work better than the paper towels. Since it wasn't quite cleaned, I let it cool completely (after unplugging the machine) and got to work wiping between the grates. Now I remember why it took me so long to make them. Whisk together the flour, salt, and lemon zest in a large bowl. 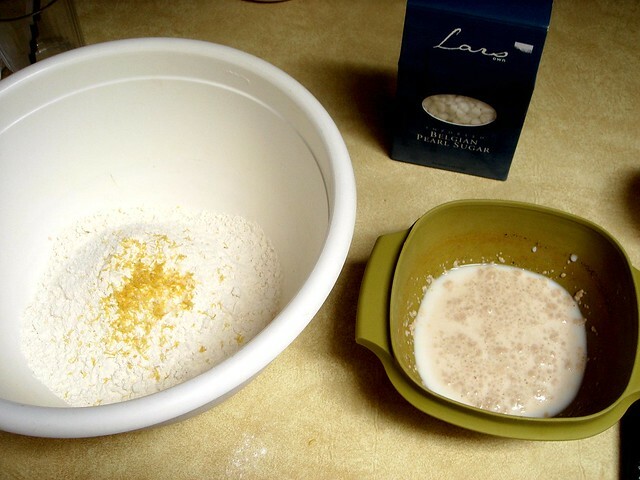 In a small bowl, dissolve the yeast in the milk and let proof for 5 minutes, or until the yeast is bubbly. Add the yeast mixture and the eggs to the flour, mixing with your hand until a shaggy dough forms. Working with half of the butter, knead it into the dough. The dough might fall apart before it comes back together. 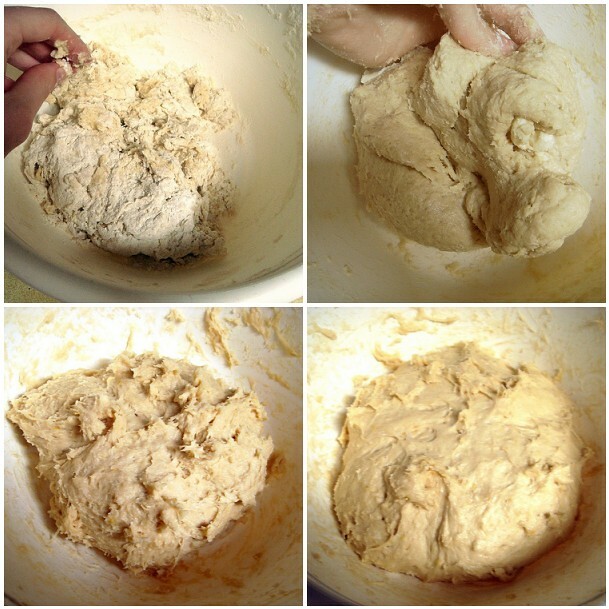 Once a cohesive dough is formed, repeat the process with the remaining butter. Knead for 1 minute. Cover with a damp cotton dish towel or plastic wrap; let rise until doubled, about 30 minutes. Preheat waffle iron. Add Belgian Pearl Sugar, kneading just until combined. 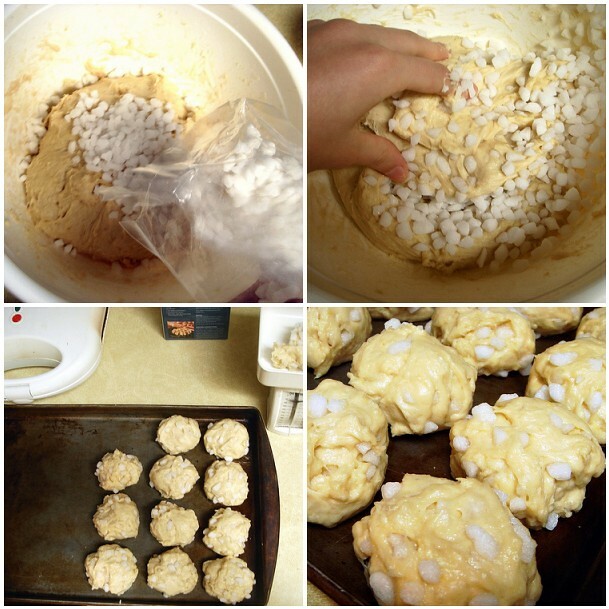 Portion dough into 3 ounce balls and place on a baking sheet. When waffle iron has heated, cook the waffles for 4-5 minutes. Carefully remove from the iron and place on a wire rack to cool slightly before eating (the caramelized sugar will be very hot). In Belgium, sugar waffles are eaten at any time of the day - breakfast, coffee breaks, or dessert. Sugar waffles taste great and remain crispy either cold or warm. Serve plain or drizzle with warm melted chocolate or caramel. Also try them with a dollop of whipped cream. Enjoy! 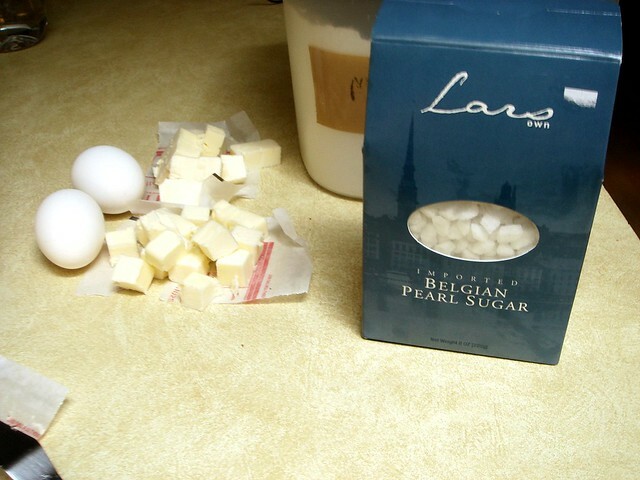 I saw these made on another blog and they looked delicious there too, but I've never seen the pearl sugar. Love the crispy but tender look. Beautiful! Tina, you should be able to find it online, especially Amazon, if it's not available in stores.